Do you know the Greek myth of Pandoras Box? Zeus gifted Pandora a beautiful box, with the instruction to never open it. Curiosity got the better of her, as it does all of us, and she opened the box. Out flew all the terrible things that Zeus could think of...death, disease, pestilence, hatred, evil, sadness, poverty, envy. Pandora quickly slammed the box shut, but it was too late, and humanity forever has to suffer for her actions. But there was one thing left in the box, and it cried to be released. It was Hope, and therein lay the saviour of Humankind. Be at peace. Hold hope in your heart. I think we all find this so hard sometimes. There are events in everyones life from time to time, that are very much NOT conducive to being at peace and being hopeful. We all have times when we're called upon to support a loved one in some way that extends us beyond our usual routine. Being emotional support to someone outside of the confines of your immediate adult family is draining. It's hard not to allow those emotions to leak into your daily life, and infect your own loved ones. How can you support someone who is facing a significant life event, and still preserve your own life and commitments to your loved ones? You might find it effective to mentally picture a little divided box, a little like Pandoras. In this box, there are compartments for relationships with different family members, friends, and significant others in your life. The box also contains the very evils that Pandora discovered...illness, envy, fear, and fatigue. How to contain the evils, whilst accessing the very necessary daily compartments of our lives, is a skill to be nurtured and practiced. 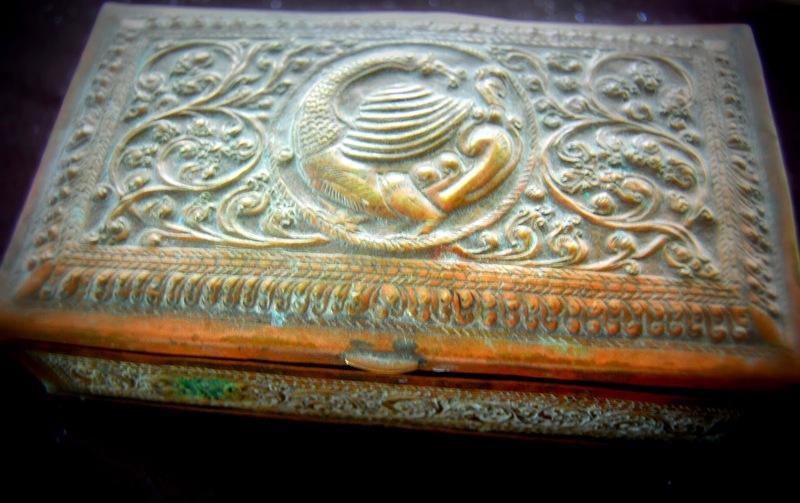 My own imaginary box is tarnished gold and embellished with flourishes. It's in fact the very box pictured above, and in that respect, it's a real box, resting on my bookshelf. I raise the lid. It's heavy so that my life can be contained therein. Each little divided compartment has it's own little flat lid, that clicks firmly into place when pressed. Each day, I consciously choose which compartments I will open. I ensure that there is a balance between home, family, friends, extended family, online family, spiritual needs, creative needs, self improvement (study, exercise, pampering), and work commitments. I only open one compartment at a time. I reach in, and immerse myself in the contents of that compartment for a specified time. Perhaps ten minutes for some, an hour for others. Always remembering that balance is the key. For me, once time is up for that little compartment, I put the contents back in, mentally imagine pressing that little lid firmly so that it clicks into place with a soft but audible snick, and move on. This ensures that one part of my life doesn't spill over into another, muddying the waters of my day. If I let my commitment to my extended family, interfere with my immediate family commitments, or my exercise or spiritual commitments, the someone is going to be unhappy. Likewise if my creative pastimes, started to impact on my role as Guardian of my home and budget, chaos would reign. The ability to switch off from one task, leave it behind and move on to another, is something we all do unconsciously to some degree. It's mainly when an unexpected situation, such as an illness, a relationship breakdown, an accident, a relocation, a job loss, or other event, is thrown into the mix, that the balance is upset. That is when you have to be entirely conscious about your choices. It's then that you might have to really think about which little compartments you open each day. Being able to compartmentalise your life, helps you to be at peace with whatever life throws your way. Accept that life has it's ripples, and that you and you alone, choose whether to allow those ripples to become waves or tsunami's with the potential to engulf you. By calming the ripples early, putting strategies in place, like timetables, diary notes, timers, appointments with a start and end time for being the support person, you can ensure that each of your life compartments are contained. You can be at peace in your own heart, that you are doing what you can, to do the good and right thing for a loved one that needs you for a moment in time, whilst still fulfilling your obligations to the other areas of your life. And remember that even in the myth of Pandoras Box, Hope was able to rise and bring peace to the hearts of Men. Even in our darkest moments, Hope can be like a soothing balm to a wound.